I have already written in the past on the importance of continuous education. Several training options are available. Among my favorite options, some cost a few dollars a month like Pluralsight and some are free like Microsoft Virtual Academy (MVA). There is another free online resource offered by Microsoft that is too often forgotten. Channel 9 is one of the premier industry-leading community content sites – there are tons of series’, shows, and events you are able to watch Live or On Demand. Microsoft really want the community to experience all of the great Channel 9 content because it is a great FREE resource with superior content. Just a few weeks ago Microsoft released on channel 9, the entire contents of the conference //Build/. Microsoft will do the same next week for the Evolve conference. Categories: Lifestyle | Tags: Training, Xamarin | Permalink. In this blog post, I am presenting how we just started the final stretch that will lead to the first release of DayTickler. I was fairly quiet in recent months regarding DayTickler. Some readers may question if we were still alive? Think again! Being silent is certainly not a sign that we drop DayTickler. It is rather the opposite. We work so hard that there is little time to feed this blog. 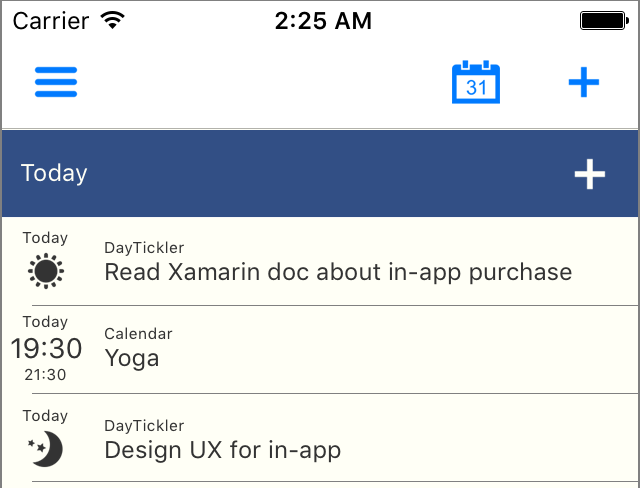 Since January, we completed adding synchronization between device’s calendar and DayTickler. This new feature allows a unified view of all your commitments into the Today list. We are very pleased with the end result. Unfortunately, on some other aspects everything is not perfect. These days we are doing a major refactoring. We are adding the ability to itemize a to-do with a work plan. This will allow to tick partial achievements (and thus get the benefit of viewing them in the Done list). For us here, we think that the world will be a better place if you feel satisfy about your day. Unfortunately, because we are not supporting correctly partial achievements, it is difficult to provide this feeling of satisfaction. This is a major discovering we did using the Beta version of DayTickler. For every little step of work, the product must reward users. Overall, we need to encourage each and every one to achieve what is important in their life whether it is a small or a large step. I leave you on this. I still have to finalize the user experience to reach version 1. Completing these latest features is a long winding road. It takes time. Give us a few more months to fine tune everything and soon you will be able to download DayTickler from your favorite app store. I’m an April 1st recipient of the Most Valuable Professional (MVP) award. Each year on April 1, while the rest of the world focuses on the April Fools, I usually find my MVP renewal amongst the other emails coming in. This year is no exception. For thirteen consecutive years, I am the proud recipient of the Most Valuable Professional (MVP) award from Microsoft. MVP status is awarded to credible technology experts who have demonstrated their deep commitment to helping others make the most of their technology, voluntarily sharing their passion and real-world knowledge of Microsoft products with the community. While there are more than 100 million social and technical community members, only a small portion are selected to be recognized as MVPs. Each year, around 4,000 MVPs are honored. They are nominated by Microsoft and other community individuals for this annual award. Candidates are rigorously evaluated for their technical expertise, community leadership, and voluntary community contributions for the previous year. They come from more than 90 countries, speak over 40 different languages, and are awarded in more than 90 Microsoft technologies. According to the MVP blog, there are 1024 of us awarded today. I’m happy to be included once again!